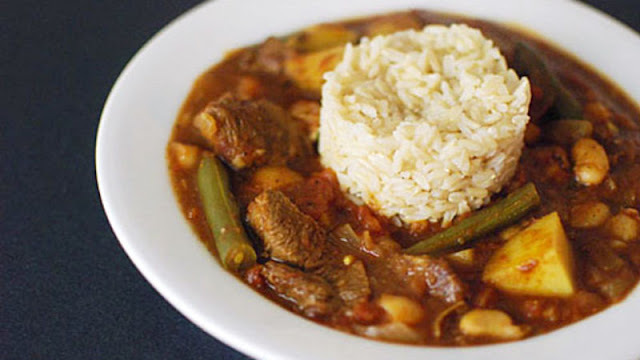 Slow cooked lamb, green beans, and potato, in a savory tomato broth spiked with cumin and allspice. 1. Cut the lamb into 1 inch pieces, dry, salt, pepper, and very lightly coat with flour. Cook in a pot on very high heat in a small amount of olive oil until browned. do this in 2 batches, making sure to brown everything really nicely. Remove the meat from the pan and set aside. 2. Add the onion to the pan, scraping the pan to release any brown bits. If there is any stubborn brown bits that are beginning to burn, splash a little water into the pan and they should come off easily. Cook the onions until they are beginning to brown. Add the garlic and cook 2 minutes. Add the spices and stir to coat everything. 3. Add the tomatoes and taste, adjusting salt and spices if needed. Return the lamb to the pot and simmer for about 2 hours. 4. Chop the potatoes into big chunks and add to the pot. Add stock if you need more liquid. Simmer 20 minutes. 5. Add the green beans (and again more stock if needed) and simmer 40 minutes or until potatoes and green beans are tender. Add cannellini beans and cook 5 more minutes. Remove from heat and serve with rice.